Professor John Evans Atta Mills, National Democratic Congress (NDC) Presidential Candidate, on Saturday asked Ghanaians to ensure that Tuesday, December 7 elections was free and fair and held in an atmosphere of peace. He asked security agencies and polling agents to be vigilant and to ensure that no cheating took place so that the winner and those who would lose would not have any cause to complain. Addressing large crowd of party supporters at a rally at the Accra Hearts of Oak Training Grounds in Accra, Prof. Mills gave the assurance that NDC "is not going to bring violence. We plead with the Government and peace officers to maintain the peace during and after the elections". 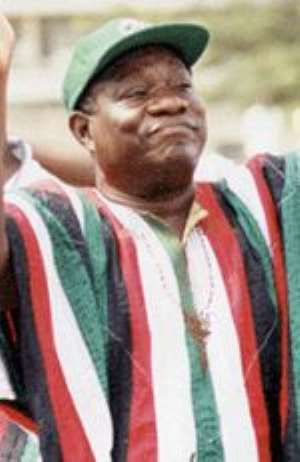 He said: "The NDC is stronger than it was in 2000 and we are sure we will form the next government." He said there were indications that the Government wanted to kill democracy and political party pluralism in the country and wanted an excuse to get rid of NDC polling agents. Professor Mills said: "I will not promise you silver nor gold but what I will promise you is that we will work with the truth. "I promise you the truth, honesty, humility and the love for one another. "I promise to preside over a united country and united people." He expressed regret that the New Patriotic Party (NPP) Government would allow into the country a person, who escaped from jail on murder and insurance charges, to give evidence at the National Reconciliation Commission. Professor Mills wondered how a Government, committed to freedom and justice could give protection and support to such a man to go scot-free. He asked: "What sort of moral lessons are we leaving for our children?" Professor Mills said throughout his travels and campaigns, many Ghanaians confronted him that life was difficult for them under the NPP Government and they could not pay high utility bills and school fees, but the Government had never acknowledged the sufferings of the people. He said, while the cost of living kept on rising the Government was giving marks to itself that, what it had done in the four years in power was "so far so very good." Professor Mills said the hallmark of good leadership was to admit one's mistake in humility since all mortals were fallible and yet "NPP, being arrogant and unfeeling, did not have the courage to say that it has made mistakes. "While the people were crying that they are suffering, the NPP continued to give the assurance that the abortive IFC loan was coming." Former President Jerry John Rawlings predicted at the rally, "Prof. Mills will win not less than 60 per cent of votes in the Tuesday, December 7 Elections. "With courage and vigilance of party members, there is nothing to stop the NDC from forming the next government." He said: "With courage and vigilance no one will die, but if none of us wanted to die, all of us will die." Former President Rawlings urged supporters of the Party not to allow seeds of confusion to be sown among them, because the current government would do everything to see the disintegration of the NDC. He told the excited crowd: "The Party does not belong to Rawlings, it does not belong to Prof Mills; it belongs to you. It is you who hold the Party together." The Former President said, the assurance that the people would go to the polls on December 7 to elect a new and better government had led to joy in their hearts and had, therefore, put an end to their restiveness, which was shown about four months ago. Dr Obed Asamoah, National Chairman of the NDC, said the NPP Government's policy of multiple tax system had been the cause of economic hardship Ghanaians were facing. He said the fact that inflation had been reduced did not necessarily translate into economic growth and that under the Highly Indebted Poor Countries (HIPC) conditions in which full cost of recovery was the object there was no reasons why life would not be difficult for the people. Dr Asamoah urged Ghanaians to vote the NDC into power as the only means of rescuing themselves from the economic hardships and the threat of big firms that were soon to lay off workers because of unfavourable prevailing business climate. Dr Josiah Aryeh, General Secretary of the Party, urged the people to vote the NDC into power to form the next government, adding that the NDC was triumphantly entering the Castle after December 7. "The NPP should get ready for a massive and shocking defeat. The victory of NDC will bury the enemy." Ms Frances Essiam, Women's Organiser, asked women to consider the cost of services and commodities such as kenkey and vote wisely. Dr Tony Aidoo, a Leading Member of the Party, said the NPP Executives should not run away, but rather stay in the country to account for 233 cases of theft and corruption. Mr. Joshua Alabi, Greater Accra Regional Chairman of the Party, urged Ghanaians to examine their lives today compared to the NDC era and vote for the NDC to improve their lot.